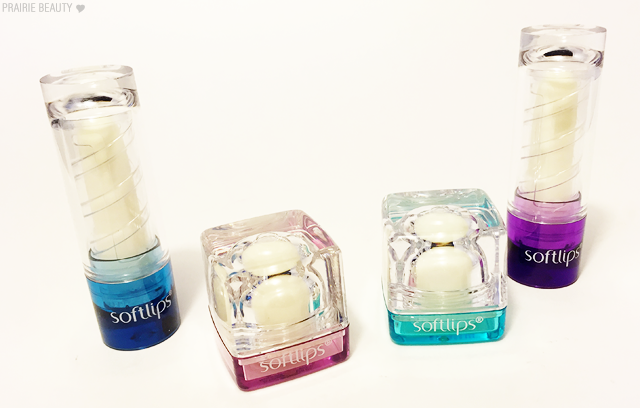 I'm not even going to lie, I've been wanting to try out the newish lip balms from Softlips ever since they were released, but my lip balm collection is slightly ridiculous and sometimes I need to reign myself in. I can't help it though, I'm a junkie for balm! 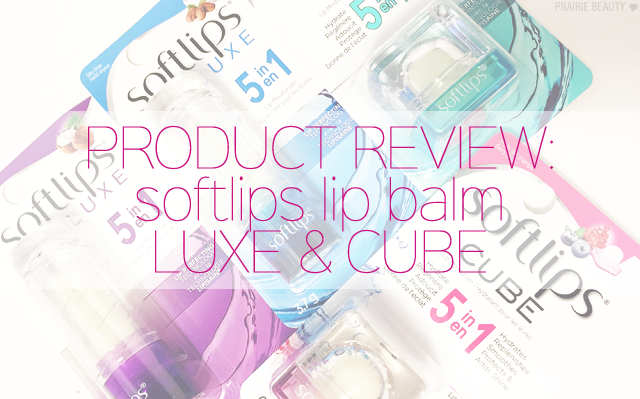 Anyway, I had the chance to try out the Softlips LUXE 5-in-1 Lip Care in Creamy Coconut & Silky Shea* as well as the Softlips CUBE 5-in-1 Lip Care in Fresh Mint & Berry Bliss* so I've been putting them to the test and I'm ready to let you guys know what I think! 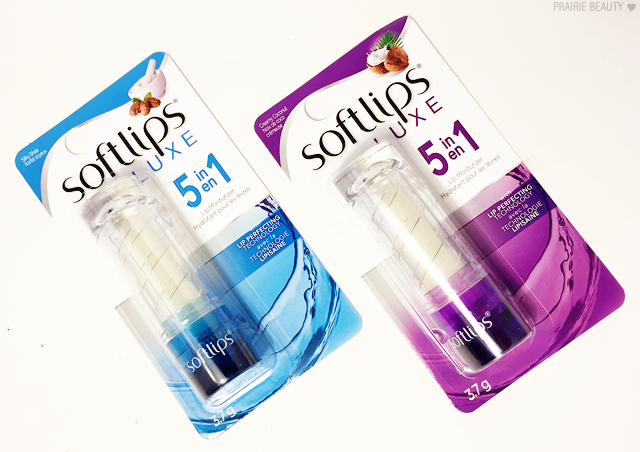 Experience revolutionary Softlips® 5-in-1 lip care in a sleek new shape. First off... Can we talk about how much I love the packaging? I LOVE IT. Not only is it really adorable with the sheer coloured base and the swirl around the bullet, but more importantly it snaps really securely shut so that you never have to worry about the lid popping off in your purse. For me, a lip balm that isn't going to pop open and ruin my bag is a big deal. I really like the formula of these, but for one thing. I like that they're really smooth and not too heavy, so I can throw them on over a colour product if my lips start to feel dry and uncomfortable and they don't disrupt the colour on my lips. I also really love the way both of these smell. I thought I was going to prefer the Coconut scent far above the Shea, because that's pretty standard for me, but both have a rich creaminess to the scent that I can't get enough of. Now, for the downside... I know a lot of people are really into having menthol in their lip balms, but it's not really my favorite ingredient in lip balms because I don't like how it feels on my lips. So overall, LOVE the packaging, really like the formula, but would be more sold on it without the menthol. 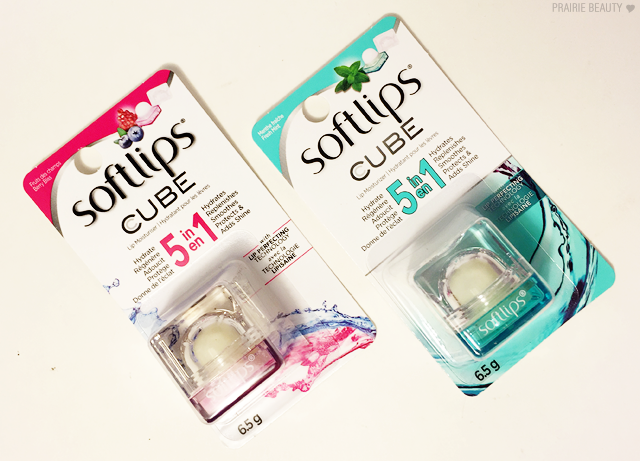 Okay, clearly these were the ones that I really wanted to try, because I love the CUBE packaging. I mean, anyone who reads this blog knows that I'm a huge sucker for packaging and these ones are just adorable. They're TINY, but they actually have quite a bit more product than the traditional bullets in the LUXE collection - and there's never anything wrong with more product, is there? Honestly, I find the formula to actually be quite similar in the two products, which I actually kind of like. These ones may be a little thicker than the LUXE ones, but not by much. They give a good amount of moisture and apply really smoothly to the lips. Weirdly enough, considering how I feel about the menthol, I actually really like the Fresh Mint version of this. Go figure! I feel like when it's specifically a mint lip balm, I don't mind so much that it feels minty on the lips. I recognize fully that my mind works in mysterious ways. Overall, I quite like these products. I have to compare them to my usual lip balm, which is Burt's Bees, and I find these to be quite a bit different in formula. These ones are thinner and lighter, so they don't necessarily last as long on the lips and give quite as much protection from the elements, but these ones definitely work better with makeup and actually make my lips look really plump and lush when worn on their own. For that reason, these will be more of a daytime and on-the-go lip balm for me and I'll keep my heavier lip balms to use along with the rest of my skincare routine. Have you tried out either of these products? I'd love to hear your comments!